Come and explore what Crème de al Crème can do for you. We offer many different services such as Wedding/Event Planning which can be scaled to meet your needs. 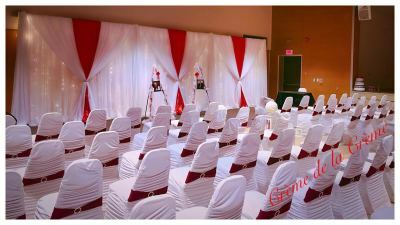 We also specialize in customized backdrops, as well as room draping and rental of linens, arches, chair covers and so much more. Our list of services continues to grow to meet your needs. 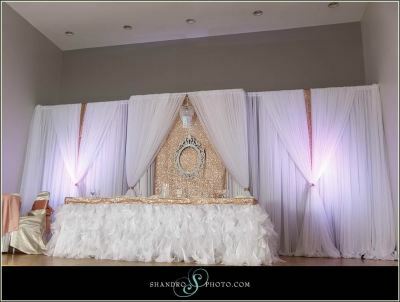 Let me customize the perfect BACKDROP for WEDDING or SPECIAL EVENT! We carry linens, arches and many more supplies to allow you to shop in one place! If you can't find it I will. Looking for that touch of colour to addto your decor? Why not add LED uplighting and tulle! Your pictures will look amazing! Have you ever wanted that special Cinderalla Skirt to dress up your head table?! Look no more! Soft white light gives a romantic feel while the bright white light gives you the modern day feel. You also have an option to add color panels to personalize your backdrop. If you can't find it - let me look for YOU! If you have a vision - let me make it a REALITY! If you are overwhelmed - let me HELP! By selecting the right material, colour and design! Together, we will plan and design the perfect backdrop. Your collaboration of ideas will create the most beautiful day.